Foursquare has recently announced in their blog that they are splitting the Check-In feature and the recommendations of places into 2 separate apps. Each time you open the app, you almost always do just one of those things. At home, you may be searching for a place for dinner. After dinner, you are probably looking to see what friends nearby are up to. That’s why today, we’re announcing that we’re unbundling these two experiences into two separate apps – Foursquare, and a new app called Swarm. – Foursquare: an app to look for places recommendations like where to eat, nearest gas station, etc. 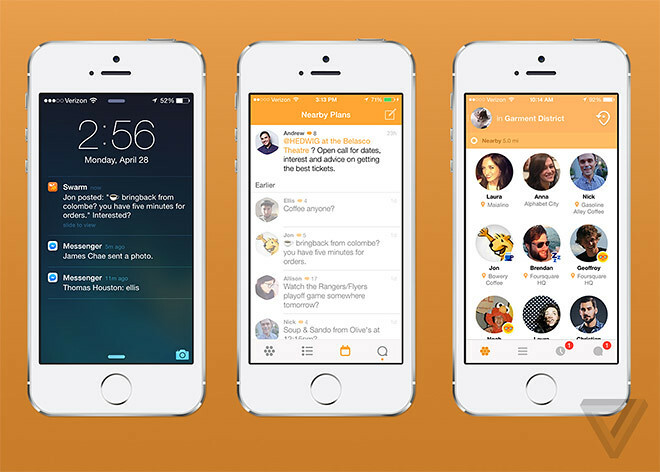 – Swarm: To check-in and find out where your friends are. Swarm will be available on iOS and Android in the coming weeks, and soon after on Windows Phone. Foursquare is also going through a revamp. Local search today is like the digital version of browsing through the Yellow Pages (remember those?). We believe local search should be personalized to your tastes and informed by the people you trust. The opinions of actual experts should matter, not just strangers. An app should be able answer questions like ‘give me a great date dinner spot’ and not just ‘tell me the nearest gas station.’ We’re right now putting the final touches on this new, discovery-focused version of Foursquare. It’ll be polished and ready for you later this summer. To get updated on the availability of Swarm, submit your email address here.